It's so sad to see someone so great like FrancisM leave our world at such an early age. But when you think of it, he's accomplished a whole lot in his lifetime, more than what others could achieve. He's truly been an inspiration in his craft. I remember when I was in school during breaks, I was memorizing lyrics to "Mga Kababayan" and was an instant fan when Francis introduced Pinoy rap to mainstream. I remember my classmate jokingly suggested that "Mga Kababayan" should become the new national anthem. I remember him tagged as the Master Rapper hooking up with DJ MOD on turntables, who was then more popularly known as the Master of Disaster and they'd perform live. I remember that whenever I'd interview upcoming Pinoy rap artists and ask who their inspiration was, FrancisM was always one of them. 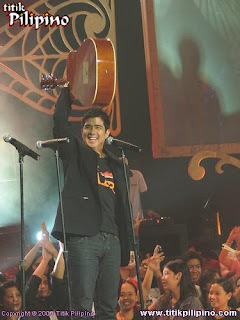 Gloc-9 never failed to mention FrancisM as his idol. FrancisM also gave new talents a break and would include them in his albums and compilations. I always attended the Philippine Hip Hop Music Awards to cover the event and you could see the mutual respect everybody had for FrancisM every time he won an award. The crowd was at an applauding consensus when he was awarded the Hall of Fame award in 2005. The milestones that FrancisM did to the music industry elevated dance, rap and hiphop into accepted mainstream. I remember that FrancisM was also a good dancer. I didn't get to see him during his breakdancing days but whenever he'd pull out some dance moves for a crowd, it looked so cool. I was surprised to see how great FrancisM danced to Michael Jackson's hit in a special dance number in Eat Bulaga in 2007. Even during practice, he gave it his all. Being a music site owner, I've met and talked to Francis on several occasions. Whenever he'd perform, you can feel his passion for everything he sets his mind on. My last encounter with FrancisM was during one of the music video shoots for Pupil. Since Ely Buendia and FrancisM are close friends, the band had the honor of having FrancisM as their official photographer for their shoot and album. I talked with FrancisM about the possibility of selling his line of shirts via our website and even if he was in a rush to leave to catch another event, he kindly told me that we could discuss it over e-mail. It is sad to lose a good citizen, a role model and an inspiration. You will be missed. Peace FrancisM.